The agile startup president looks to create an environment that is conducive to rapid growth and increase his chances of securing future funding and satisfying the board. More and more business leaders are using outsourcing opportunities to keep their organization agile. 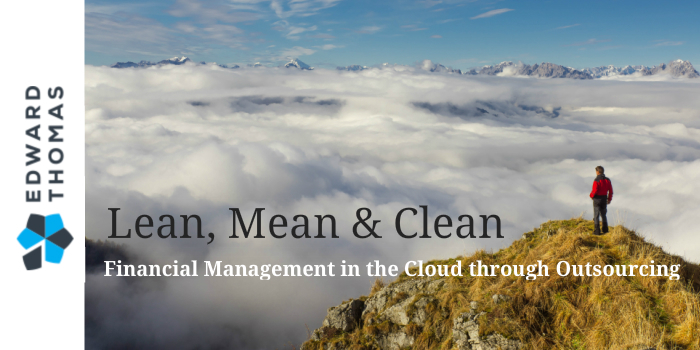 Financial Management in the Cloud through Outsourcing. Financial Management in the Cloud through Outsourcing – When you are in the midst of a fiercely competitive business landscape, you have to be prepared to act quickly. Maintaining a strong position requires speedy right action (preferably through data-driven decisions ) otherwise known as agility. The savvy business owner avoids situations that can sidetrack or bog her down. The agile startup president looks to create an environment that is conducive to rapid growth and increase his chances of securing future funding and satisfying the board. More and more business leaders are using outsourcing opportunities to keep their organization agile. The hiring process is time-consuming. Plus there’s no getting around that the person you hire will have an impact on the group chemistry of your organization – ask anyone who’s made a bad hire. When national unemployment rates are low, the risk of bringing a bad hire on board increases. Rather than hiring, growing businesses are opting to outsource as many of their non-core business functions as prudently possible. One of the easiest departments to outsource is accounting. Rather than hiring an employee who is a full-time bookkeeper or senior accountant or controller – you hire a company like Edward Thomas Associates to serve as your accounting department. They put an entire team on your account to provide a level of service and expertise that the do-it-yourself approach rarely attains. You are able to keep administrative costs low and, at the same time, enjoy support from expert accountants. Edward Thomas Associates, with offices in California and Utah, is an accounting services firm that provides your business with sharp, expert accounting insight and completes accounting tasks just as a fully staffed accounting department would – but at a fraction of the cost. We use Sage Intacct financial accounting solution on behalf of our clients. It’s the first (and only) preferred cloud-based financial accounting solution of the AICPA. You can access Sage Intacct through any device – as long as you can access a browser and the Internet. You can use your Mac, while someone else uses their PC. Sage Intacct plays nicely with other applications. You can enjoy integration between your financial accounting and other critical applications (Bill.com, SalesForce.com, American Express, ADP, Expensify – to name just a few). Does it sound too good to be true? It is good and, better yet, it is true. And, it just could be the best business decision you make in 2018. You can read more about the results others have seen here. But the best next step is to contact us. We’ll listen to get an understanding of your challenges. And your aspirations. Where do you want to go? What do you need to get there? Let’s get started today.